Jubilant scenes in the Nasa control room, following "seven minutes of terror"
But did it kill the cat? 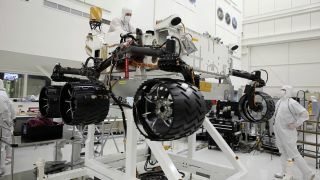 Nasa's Curiosity rover has been on the go for 36 weeks, travelling 352 million miles, but the one-tonne vehicle landed on Mars just minutes ago. It entered the planet's atmosphere, and had to endure what Nasa referred to as "seven minutes of terror" before touching down in a deep crater near the planet's equator. And it's beamed back two images from the planet's surface. The first is of the surface itself, and is a bit gloomy. But in the second you can clearly see the shadow of the vessel in the crater. We're expecting it to send back the first colour image in the next couple of days. Nasa's Odyssey satellite, which is orbiting Mars, fed back information that Curiosity has touched down successfully. The message was met with a roar of approval and jubilant scenes straight out of the film Apollo 13. Engineers and scientists who've dedicated 10 years to the project punched the air and hugged each other. The last leg of the journey was particularly dicey, with Curiosity having to pull off a series of high-risk manoeuvres to slow the vessel down from its speed of 20,000km/h. But it managed, reaching a more sedate pace of 0.6 metres per second. Curiosity is going to look for evidence that Mars could once have supported life. Nasa has sent three craft to Mars before, but the scale and sophistication of this project far exceeds all previous. "We're on Mars again, and it's absolutely incredible," said Nasa director Charles Bolden. "It doesn't get any better than this."